Drawing is a means to communicate a visual thought or idea through graphite and paper. Though we have seen plenty of artists making an effort to carve out spectacular paintings with a socio-economic message to bring out changes, it doesn’t mean you have to be always serious when you draw. 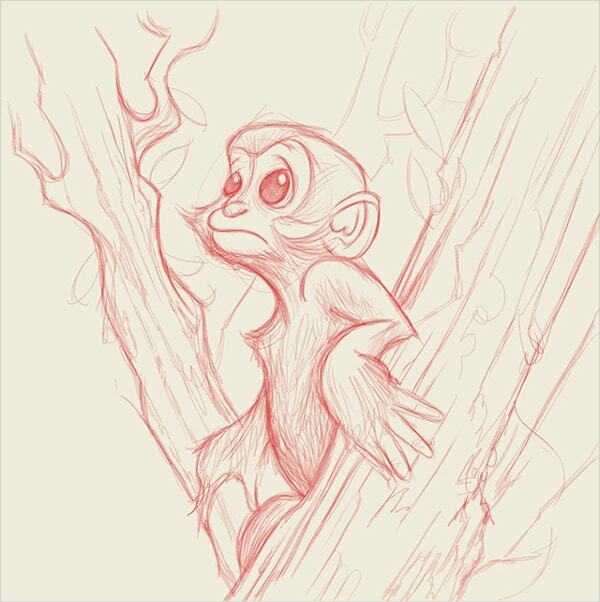 Add some funny quotient to your pencil drawings, and you have a funny picture in your hand. You can also see 3D Pencil Drawings. 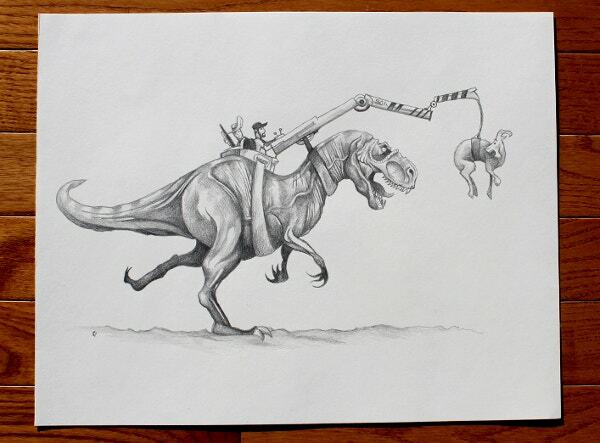 These pencil drawings are funny, but that doesn’t mean they don’t carry a message. Pencil drawings can be realistic; they will make you wonder at the creativity of the artists. 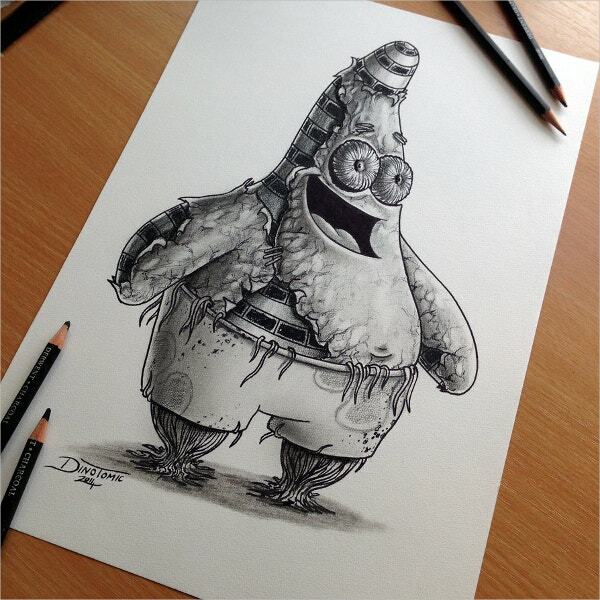 Some of these funny pencil drawings literally seem to pop out of the paper. 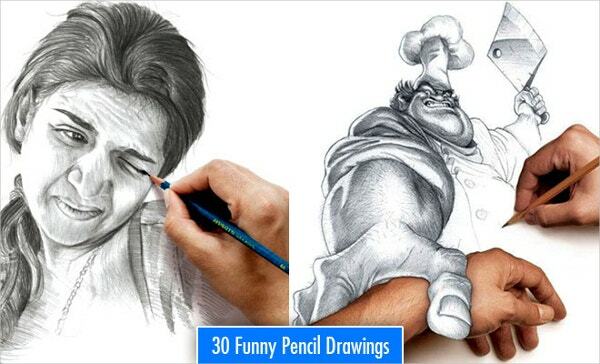 Here in the below post, we have discussed a few such funny pencil drawings that will amaze you for sure. 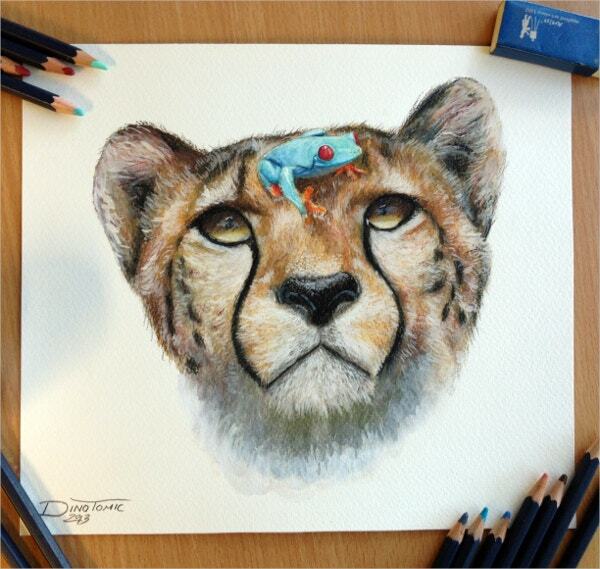 Woddy Anamorphic Pencil Drawing is an excellent piece of pencil art by the popular artist Dino Tomic. In this pencil drawing, the artist seems to have played around with the concept of perspective technique and it was a challenging task for him. 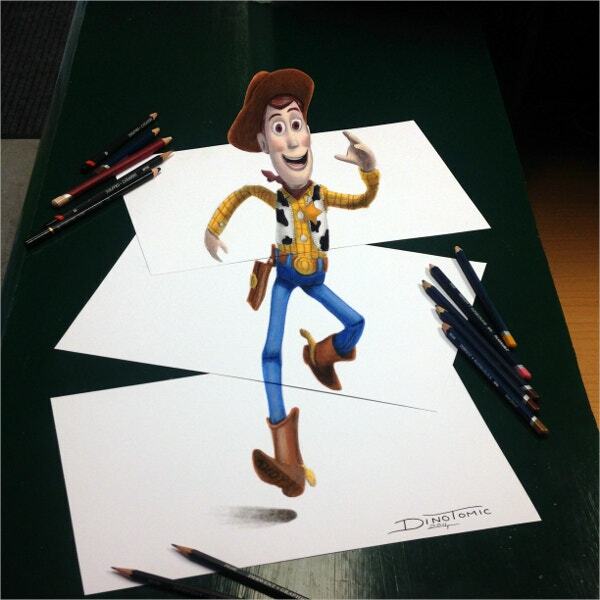 He has used four sheets of paper, and has used the fourth piece of paper as a colored background to create an illusion around the main cartoon character. The artist has created this funny drawing in a such a manner that it will give different views when you watch it from different angles. The character looks lively and that too in a funny way. 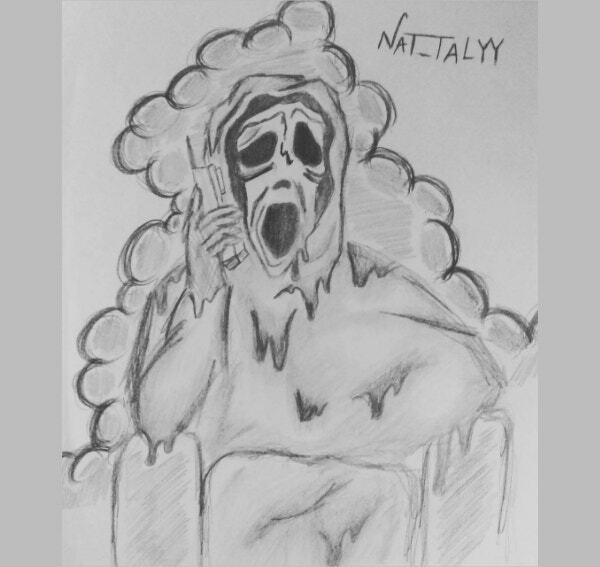 Drawing is a form of visual art and it’s one of the most efficient means of communicating a visual idea. The above drawing is an exceptional piece of pencil art, and the artist has spent a lot of time in detailing and has tried to make the characters looks as realistic as possible. In the pic towards the left, you can see how the character is blinking its eye while the artist is working on the other eye. And in the picture towards the right, you can see a funny character in the get up of a butcher trying to chop the artist’s hand. 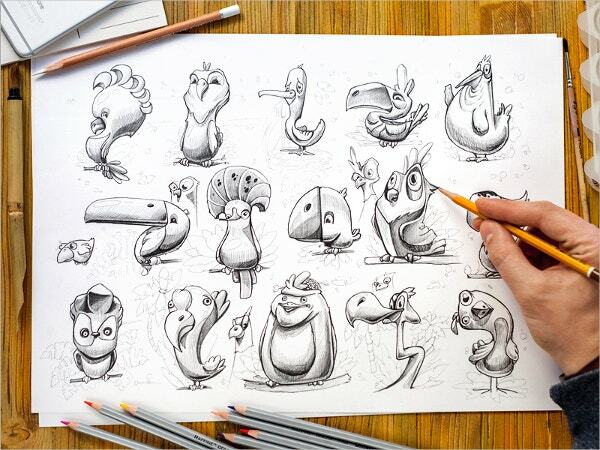 In this Birds Emotions Pencil Drawing, the artist has focused mainly on drawing a variety of birds. The artist hasn’t made any effort whatsoever to make the birds look realistic, and this is what makes it look so different from other such pencil drawings of birds. Here you can see a variety of birds like peacock, hen, etc. and they are in cartoon forms, portraying varied expressions. Funny Frog Pencil Drawing is another incredible piece of pencil drawing. 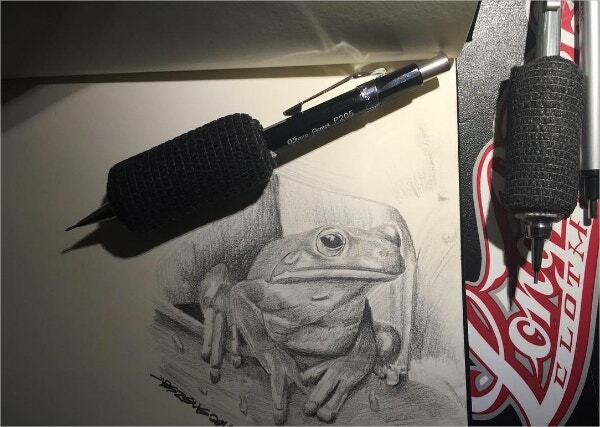 The artist here has created a realistic looking frog, and it looks so lively as if it’s going to jump anytime out of that piece of paper. That’s the beauty of pencil drawings. 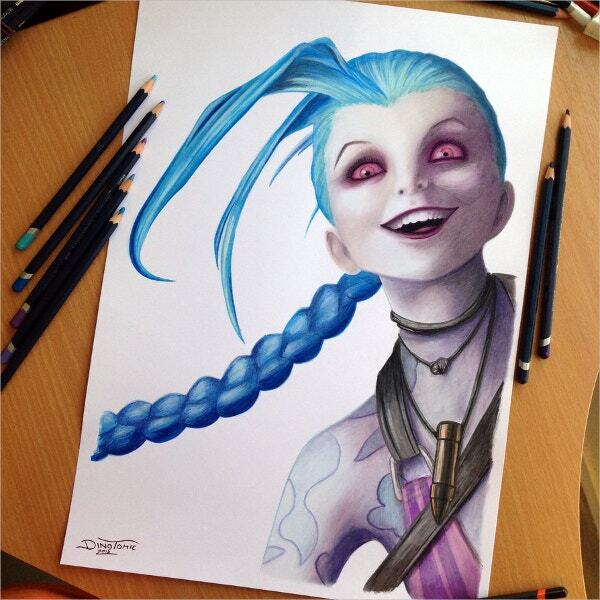 Here the artist has demonstrated an excellent usage of the light and shadow technique using a pencil as an art medium. 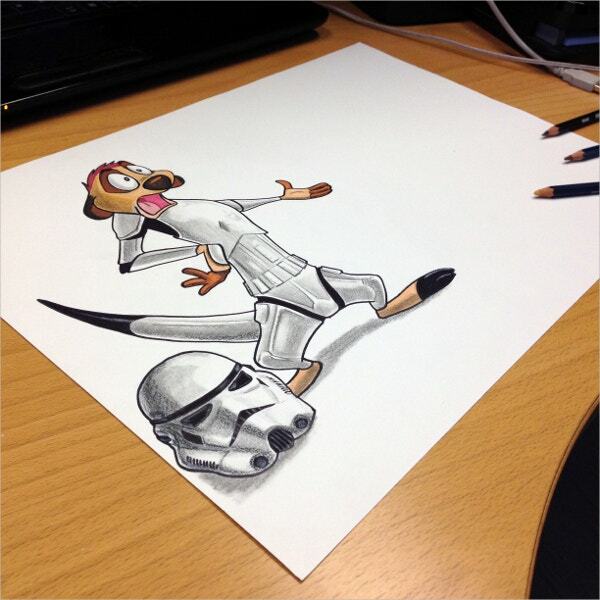 Storm Trooper Timon Pencil Drawing is yet another fascinating pencil drawing by Dino Tomic. 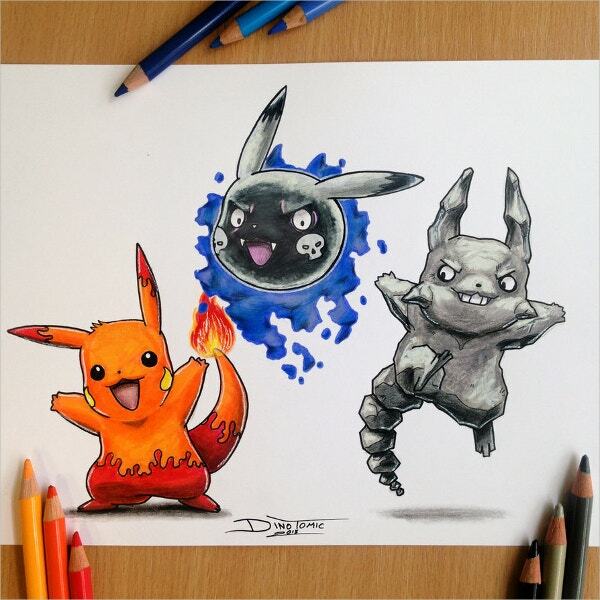 The artist has an uncanny knack of presenting his pencil drawings in a manner wherein the expressions and gestures of the characters get highlighted. Here in the above drawing, the artist has created a mesmerizing pencil art wherein the pivotal character is looking at a different direction rather than looking straight. The artist has let the audience do all the guesswork themselves. 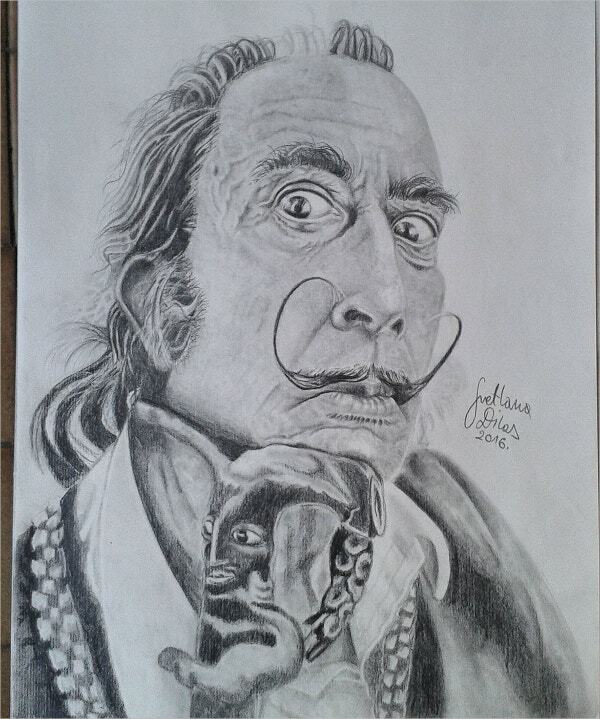 Lost Portraits Pencil Drawing is an elegant pencil art creation by cartoonist, Juan Osomo. The artist has taken the pencil art concept to another level altogether. Here the artist has not only created a few beautiful portraits of some famous personalities, but has also experimented with the thought of what all can be achieved by using various tools. And at the end, he has ended up creating a funny pencil drawing. Anyone who looks at this pencil drawing will get a smile on the face for sure. Cartoon characters are very famous worldwide, and it is a no secret that we all love them. 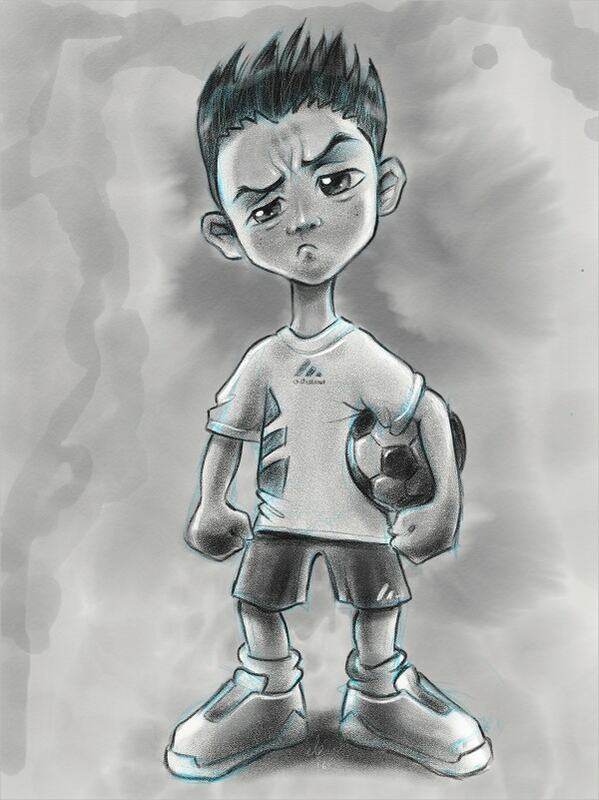 Here, the artist has created a funny cartoon character. 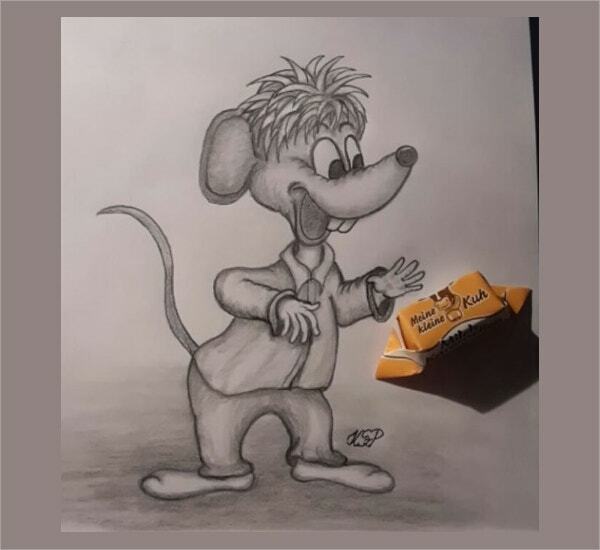 He has created a civilized cartoon character as you can see the character wearing a shirt and trousers and the tail at the back can make anyone smile. In the age of digitalization, many artists are using software like Adobe Photoshop to cover up flaws and enhance the cosmetic side of their drawings. 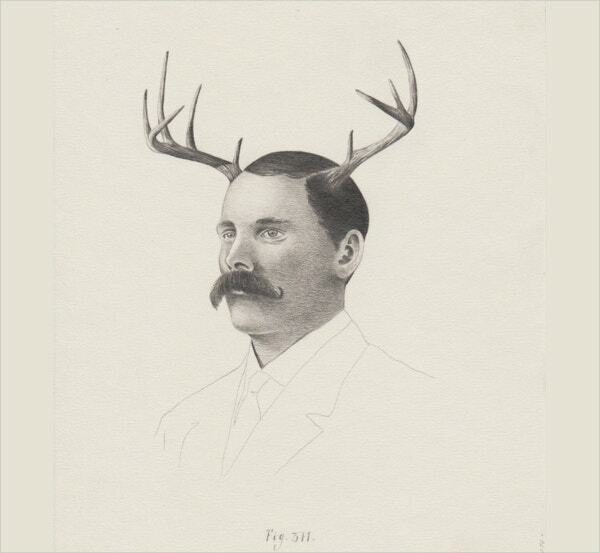 And this makes the above-mentioned pencil drawings even more amazing. 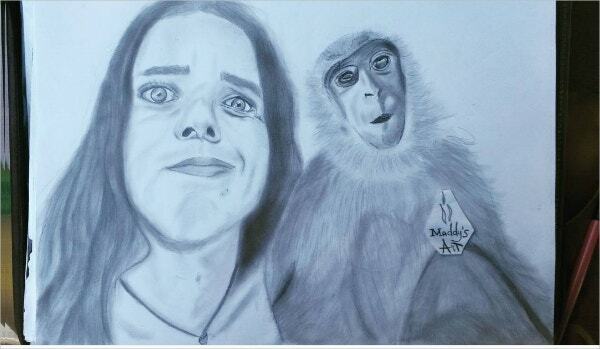 You can also see Best Pencil Drawing Pictures.